Italy from 1580 to 1620 was the birthing ground of the Baroque; this week, the ensemble Constantinople, opera superstar Magdalena Kožená, and the father of Galileo. NOTE: All of the music on this program features music in Italy from 1580 to 1620, the birthing ground of the Baroque. I. Magdalena Kožená: Monteverdi (Magdalena Kožená/La cetra/Andrea Marcon). Archiv CD 479 4595. Magdalena Kožená is back with another early music adventure on Archiv Production after her highly acclaimed ‘Vivaldi’ and ‘Lettere Amorose’ albums. In this recording, Kozena explores the early Italian Baroque Music of Claudio Monteverdi. She duets with Anna Prohaska on tracks ‘Pur ti miro’ and ‘Zefiro torna’, plus there are guest performances from David Feldman, Jakob Pilgram, Michael Feyfar and Luca Tittoto. Kozena sings with La Cetra Barockorchester Basel and Andrea Marcon. II. 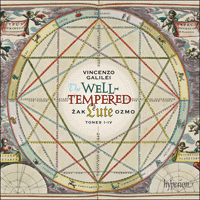 Vincenzo Galilei—The Well-tempered Lute (Žak Ozmo) Hyperion CD CDA68017. Discovering the lute in my late teens was a revelation. Until that time it was the guitar that was a close friend; we went back all the way to my early childhood: first the classical guitar, then a brief spell with its electric cousin, and then back to my old, ‘classical’ friend. From an early age, however, I also had wide-ranging interests that included literature, fine arts and philosophy, and a strong academic background in maths and science—the world seemed to me a place full of wonder. It was this sense of wonder that helped me greatly through the most difficult times after the breakup of my native Yugoslavia, and which, despite everything, allowed me to preserve my faith in humanity. After all, if human beings are capable of creating beauty as reflected in the arts and mathematics, there must still be hope for us all even in the midst of the most terrible darkness. It was upon the discovery of the lute that my varied interests finally came together. For me the lute was where music merged with philosophy, science, politics, architecture, literature, and much more. I knew that in historical performance I had finally found a calling that would truly bring together what I saw as the best aspects of human creativity and expression. I wanted to make this recording a journey of discovery combining the various elements that attracted me to the lute family of instruments, which was among the most important in Western music until the early eighteenth century. Stories of the lute’s origin take in both the Middle East and ancient Greece. The lute was infused with symbolism of the ancients, and repeatedly in its history was at the centre of movements that defined the cultural and intellectual trends of the day. The lute’s popularity as a musical instrument was at these times unsurpassed. Vincenzo Galilei’s Libro d’intavolature di liuto (1584), and more specifically its ‘well-tempered lute’ sections, presented itself as a natural choice for detailed study. This fascinating work, which circulated one hundred and thirty-eight years before J S Bach’s Well-tempered Clavier, is the first substantial musical collection to champion the versatility of a well-tempered tuning system, more precisely described as equal temperament—an earlier publication from 1567, a collection of twenty-four passamezzo–saltarello pairs by Giacomo Gorzanis (c1520–c1579), is much smaller in scope, and much less interesting musically. Galilei’s Libro demonstrated the ability of the lute to transpose pieces to any of the twelve degrees of an equally tempered scale, while using the two modes that most resemble the more modern notion of minor and major tonality: Dorian and Ionian. The Libro was created by a man who, together with his closest colleagues, had devoted his adult life trying to unravel the power of ancient Greek music and applying it to music-making in his own time. Galilei embedded his conclusions in the music of this collection. Vincenzo Galilei (c1520–1591) is today better known as the father of the famous astronomer Galileo (1564–1642), as well as of the lutenist Michelangelo (1575–1631). In his early years he himself studied the lute, and it was his considerable talent on this instrument that attracted the interest of Giovanni de’ Bardi (1534–1612), Count of Vernio, who went on to sponsor the young lutenist’s studies with the famed Italian music theorist and composer Gioseffo Zarlino (1517–1590). It was, however, through Vincenzo’s involvement with Bardi’s Florentine Camerata—an influential group of humanists, musicians, poets and intellectuals who gathered at Bardi’s house to discuss and guide trends in the arts—that he really came into his own as a theorist and a composer at the forefront of the humanist movement in music. Galilei’s Libro was a truly groundbreaking work, a product of his accumulated knowledge, insights and visionary ideas about the nature of music of his time. The collection was preceded by important theoretical treatises and other musical collections: Intavolatura de lauto (1563), a collection of vocal transcriptions and ricercari for the lute; Fronimo (1568), a treatise on the playing of the lute; Primo libro di Madrigali a 4 a 5 voci (1574), a collection of madrigals; and Dialogo della musica antica et della moderna (1581), which deals with tuning, monody, and a history of musical instruments. The manuscript, in Galilei’s hand, is today preserved in the Biblioteca Nazionale in Florence, under the full title: Libro d’intavolature di liuto, nel quale / si contengono I passemezzi, le / romanesche, I saltarelli, et / le gagliarde et alter / cose ariose com / poste in diversi / tempi da / Vincentio Galilei / Scritto l’anno 1584. It is written in Italian tablature, which uses numbers to indicate the position on the fretboard where a finger is to be placed; the highest course of the lute—comprising a single string, or two strings tuned in an octave or unison—corresponds to the bottom line of the tablature staff. The collection was composed for a six-course lute. The collection is divided into three main parts, of which this recording focuses on the first two. The Parte prima contains sets of dances—passamezzos, romanescas and saltarellos—on each of the twelve ascending semitones of the equal-tempered octave, starting with the pitch of the lowest, open course. The passamezzos, duple-metre dances, are based on the ground passamezzo antico, which follows the harmonic pattern of i–VII–i, V–III–VII–I, V–I, with small Roman numerals indicating minor triads, and the capital numerals major triads. They are all in the Dorian mode, a natural minor scale with the sixth degree raised. Each passamezzo is followed by a corresponding triple-metre romanesca antica with an almost identical pattern of III (or i)—VII–i–V–III–VII–i, V–I–IV–I. Despite the striking similarity of these grounds, Galilei in his writings made references to ‘the excited sound of romanesca and the quiet one of the passamezzo’, referring, presumably, to their affective nature as he perceived it, and which, whenever deemed appropriate, I have tried to preserve in this recording. Every passamezzo–romanesca pair is followed by a saltarello, also a dance in a triple-metre, on the same scale degree. Unlike the common practice of the time, the saltarellos are not modelled on their respective passamezzos, and their chord sequence is I–V. Part two of the collection is entitled Parte seconda nella quale si contengono altri Passemezzi, et Romanesche, and as the title indicates it comprises passamezzos and romanescas only. As in the first part, they are organized in sets on each of the twelve semitones of the equal-tempered octave. In this section the mode used is the Ionian, which to modern ears is very close to a major key. The passamezzo ground used is therefore that of the passamezzo moderno: I–IV–I–V–I–IV–I, V–I; the romanesca ground in this instance is I–IV–I–V–I–IV–I, V–I–IV–I, making it the romanesca moderna. Although this second part does not include saltarellos, each passamezzo–romanesca pair is followed by a note indicating that the corresponding saltarello from the first part, on the same degree of the scale, can be played at that point. The first two parts of the collection function as a distinct unit. The third part—Parte terza et ultima nella quale si contengono tutte le sue Gagliarde—consists of fifty-six galliards, virtually all of them with mythological names, and two additional versions of the dances in part one. The galliards do not appear to have any structured tonal connection with the previous two parts. Finally, there is an appendix at the end, entitled Gagliarde et arie di Autori diversi, which contains pieces by various composers, as well as passamezzos and romanescas which might complement those in parts one and two. The appendix was evidently compiled and written out at a later time than the rest of the manuscript, as indicated by much less precise handwriting throughout. This recording includes sets of passamezzo antico–romanesca antica–saltarello, followed by the corresponding passamezzo moderno, and its romanesca moderna, on the first four steps of the scale. As I used a six-course lute in G tuning, which would be common in Italy in Galilei’s time, the bottom open string is G. Therefore, the dance sets are recorded here are based on scales starting on G, G sharp, A and A sharp. My instrument was set up and tuned in equal temperament, as advocated by Galilei in his writings. It is also worth noting that for this recording the fundamental strings of the fifth and sixth course were in gut, as they would have been in Galilei’s time, allowing for greater clarity of lines and less interference from a sustaining bass than would be achieved from wound strings (which were invented much later but are frequently used on Renaissance lutes today); the trade-off, however, was an occasional slight fluctuation of intonation in the bass strings when fretted in higher positions, which is characteristic of the string material in this set-up. There has been some uncertainty among both lute scholars and performers as to whether this collection was intended for performance, or if it is fundamentally a theoretical work. This quandary is largely due to the exceptional difficulty of the material, as the collection pushes the technical and artistic capabilities of both player and instrument to their limits. To start with, in order to play pieces on each step of a chromatic scale, the player needs to keep the index finger of the left hand flat on the fingerboard almost continuously after the first step, while the rest of the fingers are fretting the intricate passages of music. This in itself requires considerable strength and agility in the left hand, and is not for the faint-hearted. III. 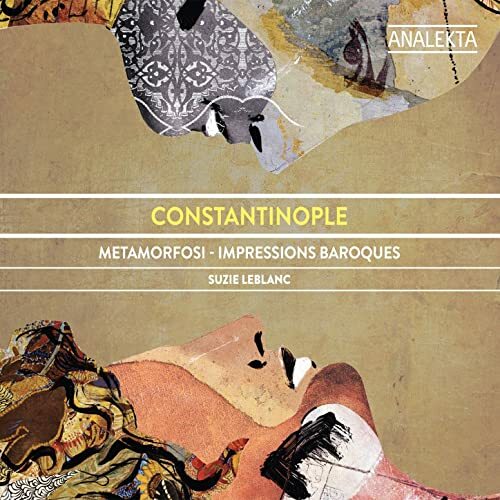 Constantinople—Metamorfosi: Impressions Baroques (Suzie LeBlanc/Constantimople). Analekta CD AN 2 9142.